Just in case you didn’t know, Firefox Sync is a very convenient service Mozilla gave to the world: you can can keep synchronized history, bookmarks, tabs and passwords between different Firefox installations, on different platforms and devices. Your data is always protected, so only you have access to information like your passwords and browsing history. (and I’m pretty sure they’re not lying), people usually like to keep private data private: encrypted is good, encrypted and at home is better. Toby Elliot (Mozilla team), some months ago released a minimal version of the “real” sync server: it lacks all the user management api, but is a full implementation of the storage part. Set up Apache (or equivalent), configure your Firefox to a custom server, repeat for every device, and you’re done. I’ve been using it for more or less two years (iPhone and Android clients included), and indeed it works rather well. Sadly, it is now discontinued, since the php version has been dropped and now Mozilla runs a brand new python sync server. There are instructions, if you want to set up your own, however it is not for the soft hearted (especially under Windows) and the server itself seems to be a bit more resource hungry than the minimal version. 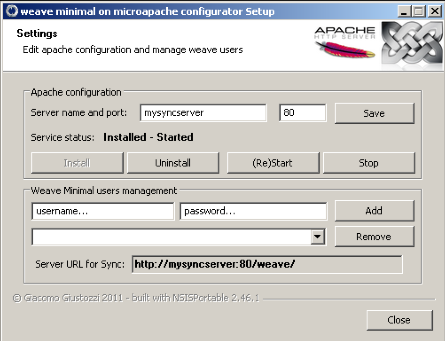 If you want to try the weave minimal server on Windows, I have packaged microapache 2.0.63 with PHP 5, weave minimal and a simple GUI to configure and manage it (built with NSIS). The functions are quite self explanatory: in the upper section, you can configure the servername and the listening port for apache, and install/uninstall/start/stop the server. In the lower section you can add a new user to the sync db, remove already existing users, and you can see the url to use in Firefox. 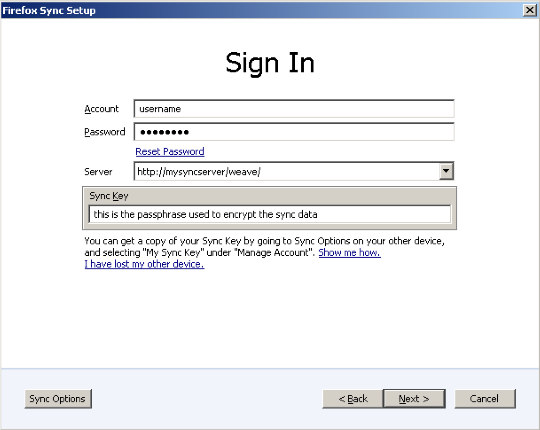 To setup Firefox: Set up Sync -> Connect to an already existing Firefox Sync accont -> I don’t have the device with me -> and then complete the form and save. The GUI needs admin rights.As long as it has to interact with Windows services, there isn’t really any alternative. If I receive enough feedbacks, I could release a no-service version of the GUI. Tested on XP only (should work on Vista and 7, tho). You can download it here (less than 4MB for the whole package), just decompress the archive and run config.exe. Sources will be released on google code after some cleaning. UPDATE: v0.11 – fix: not working on non standard HTTP/80 port. This entry was posted in technology, weave-minimal-GUI and tagged firefox sync, microapache, nsis, weave by PsychoWood. Bookmark the permalink. ii) Has been the user created in advance in the configuration GUI? The “Invalid method in request \x16\x03\x01” should be caused by accessing an http url in https or viceversa, did you try accessing the weave server via browser? i) will connecting to the sync ‘server’ for the first time set it ? It seems there is a problem when using a non standard port, could you try if port 80 works? The other settings should not matter, I tried it within a directory with spaces, with or without ‘@’ in the username. Should be fixed now, would you mind downloading v0.11 to to see if it’s working for you? The data on ‘remote’ device has been synced only /after/ I went Options->Sync->Manage Account->Reset Sync and went ahead with selected option (maybe upon setup it automatically does /merge/ even if I manually select /replace/, I don’t know – don’t want to reproduce, don’t want to kill my bookmarks ;)) seems like FF glitch to me. Looks nice, thx for the guide will try my luck! just like to thank you for the setup, helped me a lot to get it running on windows..